And once again in the flurry of action that occurs during and after LCA, I have completely neglected to update my blog. So since then, I’ve been doing various bits of development work for my benevolent mad scientist overlords at Secret Lab; this Thursday I’m off to the San Francisco Bay area to do three weeks of onsite work with my next client, which should be thoroughly enthralling. I suspect the most reliable place to find any evidence whatsoever of my recent activity will be my Flickr stream, though I may take Jethro Carr’s lead and just post regular blogs with lots of pictures every other day (at least it *looks* like he’s had regular activity…). Oh hey, I appear to be in Brisbane! Linux.conf.au 2011 starts tomorrow, which means that today is the fun day of hanging around at the conference accommodation and watching the comings and goings of LCA people, and registering for the conference. Registration opens from 16:00 at the QUT Kelvin Grove Campus*, I personally intend to get to the venue sometime around 17:00. As I understand, Rusty Russell’s usual newbies’ session is being held today, and that’s on at 18:30, also at QUT Kelvin Grove. If you’ve not been to LCA, this session comes highly recommended — I should know, I’ve been to all of them! (wait, what?) The session helps explain what LCA is all about to people who haven’t been, contains important advice about what sessions to show up to, and how to read the schedule. Well, that’s it for me. Maybe another update later today? *Kelvin Grove being the QUT campus where the conference was originally scheduled NOT to be at. The conference organisers have done an awesome job at making sure that the event is going ahead at a new venue, especially given the conditions in Brisbane of late. Kudos etc! Further to a post made by Rusty Russell earlier today, LCA2011 have just published a detailed anti-harassment policy on the conference website. 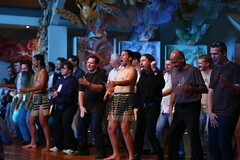 Well done to the LCA2011 team for promptly and publicly preparing such a policy. Linux.conf.au 2011 Miniconf Timetables etc. I look forward to seeing you at either of these miniconfs, presenting or otherwise! Oh. You probably won’t be surprised to hear this one, but the answer is Linux.conf.au the Australasian Free and Open Source Software Conference. I’ve been attending since Melbourne 2008, and have since “been” to Hobart in 2009 and travelled to Wellington to attend in 2010. LCA is a great conference because it gives people in the broader FOSS-using community in Australia (people like me) the opportunity to meet the people who put together the software that we used on a day-to-day basis. 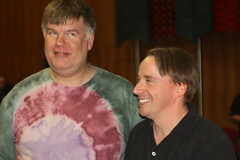 It turns out that they’re an entirely friendly bunch of people, who are all too willing to share their experience: in 2008, Andrew Tridgell spent 20 minutes one-on-one with me explaining how a particularly awesome piece of code he’d written worked. In 2010 I ran one of the short single-day conference streams (known as “miniconfs”), on the topic of Open Programming Languages. This was a fantastic opportunity to give back to the LCA community, and help bring more of the topics that I was interested in to LCA — we had a fantastic lineup of presenters, and the day went awesomely. I’m glad to have the opportunity to do this again: I’m running the Open Programming miniconf at LCA2011 in Brisbane, and along with my friend Peter Lyle, will be running the Research and Student Innovation Miniconf. Both of them are shaping up to be excellent miniconfs. So yes, LCA is in Brisbane this January, and I thoroughly recommend you get along if you can! In case you’ve missed it in other channels, the linux.conf.au 2011 miniconf CFPs close on Friday October 22 (for the most part). The LCA2011 Open Programming Miniconf helps bridge the gap between the low-level developer and the end-user by bringing the topic of tools and techniques for application development to Linux.conf.au. We invite 25-minute talks on a wide range of topics, tools and languages with the aim of bringing together open source developers with presentations that share techniques, best practices and values amongst users of all open source programming languages. If you know something about a topic of interest to the LCA Developer community, please read our call for presentations and submit a proposal! The FOSS in Research and Student Innovation Miniconf brings together researchers and students with an active interest in Free and Open Source Software with the broader Linux.conf.au community to highlight exciting work taking place within the often esoteric world of academia and educational institutions. We invite 25-minute presentations on topics in two streams: “FOSS in Research”, which provides an informal outlet for those pursuing topics of interest to FOSS communities in their studies; and “Student Innovation”, which brings the perspective of the student delegation to the forefront, by allowing them to share their experiences of FOSS with the broader LCA community. Because my insanity knows no bounds, I’m helping out with a second miniconf at Linux.conf.au 2011 in Brisbane. The CFP is now open at the Miniconf web site, so if you’ve got something to say, please do submit a proposal! I’m very pleased to announce that the LCA2011 organisers have accepted my proposal for the Open Programming Miniconf to be run at Linux.conf.au in Brisbane in January. This is a new, improved, shorter-titled successor to the wildly successful Open Programming Languages Miniconf that was held in Wellington earlier this year. The Linux.conf.au Open Programming Miniconf is a single-day mini-conference about application development with Open Source tools. Featuring talks on a wide range of topics and programming languages, this miniconf aims to bring together open source developers with presentations that share techniques, best practices and values amongst programmers of all open programming languages. 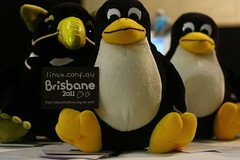 OPM2011 will be held at Linux.conf.au 2011, at the QUT Gardens Point Campus in Brisbane in January. Whilst the miniconf is yet to be officially announced, the proposal submission system is online at the miniconf website. I look forward to seeing some awesome presentation proposals coming through in the coming weeks!